Hope you have all had a great weekend, I have been having some fun today colouring a few images and I decided that I would use one of these and for a change follow a sketch, this one being from Sketch Saturday. Gorgeous card Pat, I love the pretty image and beautiful papers. 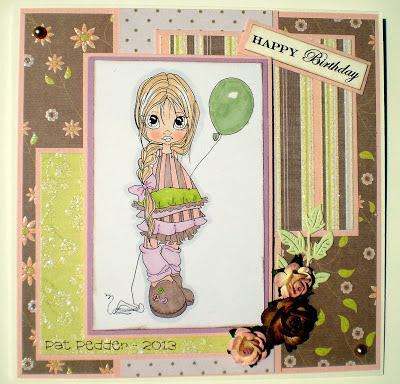 This is gorgeous Pat, love the image and pretty papers. Thanks for joining us at Sketch Saturday this week! Lovely image beautifully coloured and I love your selection of bp's. Great colours and patterns. What a wonderful card! Love the papers and colors you used. Thanks so much for sharing with us at Creative Card Crew. Hope you have a fabulous day! So beautifully coloured Pat, I think I need to pop along for lessons. Gorgeous card Pat love the wonderful colours you have used for the image also the papers you have used, super, super card. Love your layout and colours. Super card!!! Thanks for entering Creative Card Crew challenge. This is a lovely card. The Saturated Canary digi is very cute. Thanks for playing along in the Creative Card Crew Birthday challenge. Cheers FiLoMa. Why is it that you always seem to select the best papers with the best colors. Your coloring amazes me! Lovely!